One of south Utah's lesser-known red rock regions extends across the southeastern slopes of the Pine Valley Mountains, right at the west edge of the Colorado Plateau. The upper parts of these isolated mountains, rising to 10,365 feet, are volcanic in origin, but a wide band lower down is formed of the familiar Navajo and Kayenta sandstone, here colored a range of rich shades of orange and red. The rocks have eroded into some steep cliffs but mostly large areas of undulating mounds of thin-layered strata, partly vegetated, and the area can be viewed from afar along Interstate 15 which runs past close by. 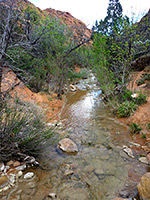 All the land is publicly owned, administered by the BLM or USFS (part of Dixie National Forest), and there is one developed region; Red Cliffs Recreation Area, which is centered on the year-round stream of Quail Creek. Not far downstream this exits the red rock layer and is impounded to form a reservoir, within Quail Creek State Park, but in the recreation area the stream soon becomes enclosed, and for a quarter of a mile flows through an enchanting series of pools, cascades and chutes, all surrounded by a narrow, smooth walled sandstone gorge known as Water Canyon - the highlight of the park. 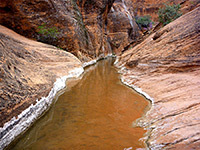 There are very few similar ravines in the Southwest, as those that do hold a permanent stream, such as in and around Zion National Park, have rocks that are more greyish in color. The recreation area also contains several little-used trails across the surrounding lowlands; most visitors are here for picnicking, camping, and walking along the lower narrows. A few deep pools stop the majority of people from continuing all the way through, though the slot doesn't extend too far, giving way to a more overgrown gorge, rather less enclosed. 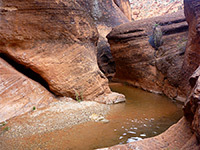 The recreation area falls within Red Cliffs National Conservation Area, which includes several other scenic regions like Buckskin Hollow and the Yant Flat Cliffs. Access to Red Cliffs Recreation Area is via old Hwy 91, between Leeds and Hurricane Junction. About half way along, beside the upper end of Quail Creek Reservoir and opposite the St George KOA campground, a side road forks northwest, passing underneath the two lanes of I-15 via low height (11' 9") bridges. The preserve entrance is on the far side, next to an overflow parking area, as space is quite limited at the creek/campground, 1.5 miles further. But if full, the walk from the entrance takes less than half an hour, along trails or the road. Unlike Quail Creek State Park, the recreation area does not appear to be signposted from nearby main roads, yet it is quite popular, mostly with families. Several short trails start from the overflow parking area, to such destinations as an old Mormon homestead (Orson Adams House), the remains of a 1954 movie set, an ancient Anasazi site and the lower section of the creek, plus several longer routes; one (the White Reef Trail) follows a line of jagged rocks northwards, past three sets of Jurassic dinosaur footprints. But the main path is the Red Reef Trail, starting at the far end of the road, beside the picnic area. This follows the creek, initially still surrounded by open, sandy ground, towards a line of low cliffs to the west. The cottonwood-lined drainage becomes enclosed after half a mile, and a little wading becomes necessary to continue. The water is generally just a few inches deep but some pools can be 2 to 3 feet deep. 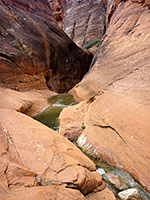 The number of hikers soon tails off due to a short series of obstructions; first is a deep pool, passed using footholes carved into the rocks on one side, aided by a rope. The narrowest section is not far beyond, leading to another pool and chokestone and then a deeper flooded channel with a low bench to one side. After here, the watercourse widens; bushes, trees and boulders line the creek, and a faint path follows one or both sides. 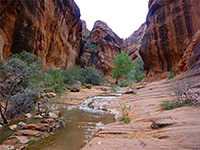 The ravine remains similar for about 2 miles, with a few more brief enclosed stretches, until the rocks become grey-white rather than red, the drainage splits several times, and becomes shallower.